You get the idea: those who fail to plan, plan to fail. Nevertheless, despite the best intentions of IT directors and clever advice from well-meaning bystanders, teams will too often make a big new IT investment and then rush madly to get it up and running before Friday. We know how it is, time being money and all. But think about your investment this way: given the cost, wouldn’t it help to step back and view the bigger picture? It takes time to figure out how to take full advantage of all the new processes the tool offers. This is the long-awaited chance for your team to redefine the way it operates—and make everyone’s job easier in the long run. The Examine phase is an opportunity to get that proverbial big picture, which is crucial to accurately assess your organization’s current state. We encourage project teams to approach this phase head-on instead of rushing through the complex implementation processes. This is a time to make your voice heard by stakeholders to bring your new ideas to fruition. During your Examine phase, take a look at the areas that need the most attention. When you take the necessary time to plan up front, you allow your new investment to be implemented on schedule, under budget, and exactly the way you envision it. Your path to implementation success will require a series of milestones, such as initiating the project, scheduling kickoff meetings, and determining which steps will be needed for your organization to transition away from its legacy system to a shiny new one. 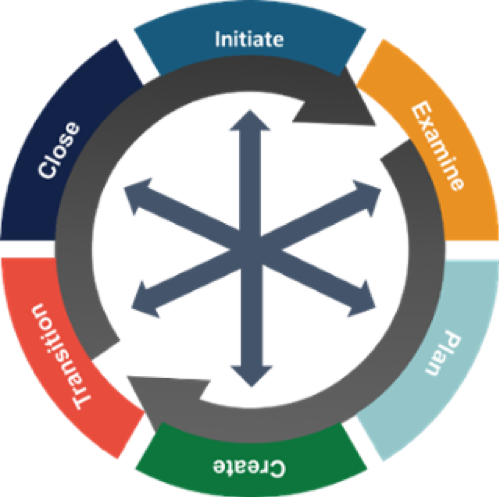 To ensure everyone understands and follows the correct path to successful implementation, the artisan engineers at Cask use a precise process known by the acronym SAIF, or ServiceNow Adaptive Implementation Framework. Initiate: Prepare your teams, find the appropriate resources, and schedule kickoff meetings. This is a chance to get to know your contractor and set project expectations. Examine: Look at your current processes in detail with your project consultants. Identify the processes and define the requirements that will give you the tools your organization wants. Create: Watch your Cask development team craft your new tool like it was designed just for you, based on the exact requirements you provide. Transition: Now you get to try out your new tool. User Acceptance Testing is the main focus here. We break things, then try to break them again in order to work every bug out of the system before it goes live. Define, redefine, then redefine again. This is how Cask approaches every requirements workshop. Capturing unquestionable requirements is the most critical part of implementation, hands-down. It’s no easy task to translate business problems into functional requirements and user stories. In fact, a Cask Business Process Consultant or Architect might tell you it’s more art than science. Getting a new tool built the way you want depends entirely on the clarity of the requirements provided to your developer. Your requirements should detail every aspect of what you intend to accomplish. Requirements can be large or small. It’s okay to capture an ambiguous requirement during the Examine phase—this is actually a typical occurrence. But once you enter the Planning phase of your implementation, you need to pare down the requirement to get down to the bottom of the request. This technique is referred to as “slicing” and it ensures that you and your technical team understand every aspect of the requirement before a line of code gets written. Remember to look before you leap, otherwise you never know where you’ll end up. It takes time to implement new tools and processes correctly. That’s why it’s important not to take too much on all at once (or bite off more than you can chew, as our mothers used to tell us). Say, for example, your Service Desk only handled Incident, Change, and Problem tickets before implementing your new tool. As capable as your team may seem, it may not be ready to handle Project Portfolio Management, HR Case Management, and two other applications in parallel with your current ones. So try to be patient—those other applications will be there when you’re ready to take on more. It’s easy to get caught up in the excitement of a new tool or process. So it’s worthwhile to first step back and take a long, hard look at what implementation will actually require. When you take the time to create a roadmap to success, then go one step at a time and capture the detailed needs of your teams – you’re certain to reach your destination. Promise. Drop us a line at https://caskllc.com/contact/and let us know how our experts can help you and your organization succeed.